In May 1955, under the direction of Mrs. Katherine Kokkinos, The Argo-Summit Women’s Club, which initially began in the 1930, obtained a state Charter to function as a nonprofit organization. After a couple of meetings with His Grace Bishop Ezekiel, the community began fund-raising for the new Greek Orthodox Church in the autumn of 1960. Shortly thereafter, Mrs. Kokkinos and the committee considered the purchase of “The Church of God” church building at 5417 S. Hunt in Summit. Also for sale was the house next door to be renovated for the use by both the Greek School “Sophocles” and Sunday school. The purchase of this property was finalized in February 1961. In 1959, Father Andrew Kleomenakis from the Assumption Church performed the first Easter Liturgical Services during Holy Week in a local hall and there was an enthusiastic response from the community. 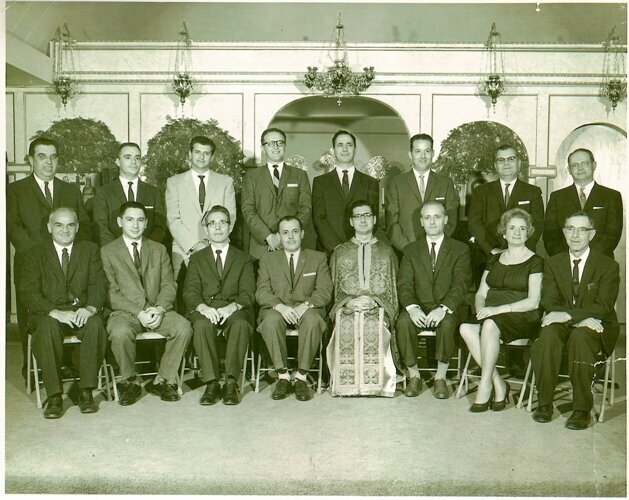 In the fall of 1960, approximately 125 families began fund-raising for the new Greek Orthodox Church. The women held a dinner dance in the autumn of 1960, collecting many pledges and donations. The name given to the new church, Holy Cross Greek Orthodox Church, was suggested by Mrs. Katherine Kokkinos. The first Divine Liturgy was celebrated on Sunday, March 5, 1961 with Father Chrysostom Selimos as our Proistamenos. A parish Council was elected and the first Parish Council officers were President – Mr. John Muros, 1st Vice President- Mr. Nick Svarkonis, 2nd Vice President – Mr. Spiros Hasiakos, Secretary – Mrs. Katherine Kokkinos, Treasurer – Mr. Evans Nickolaou. Peter Bastounis, Arthur Karounos, Leo Kotoulas, George Margarites, James Stopoulos, Plato Troy, Gus Tsourmas, James Vlahos, Louis Vlahos, and Peter Vulitsas were the first members of the newly elected Parish Council. The officers and the Parish Council met with His Grace Bishop Methodios who recommended that father Chrysostom Selimos serve our Church as Proistamenos. The unofficial opening of our Holy Cross Church was on March 2, 1961 celebrating Great Vesper Services. The first Divine Liturgy was celebrated on Sunday March 5, 1961. The house next door was renovated with school desks and chairs obtained from Graves Elementary School in Argo. Mr. Michael Nickolaou became godfather of the Greek School and named it “Sophocles”. The first sacrament in the Holy Cross was the Wedding of Mr. and Mrs. Paul Karoubas by Father Selimos. The first baptism in Holy Cross was Georgette Koklanis by Father Selimos with Mr. & Mrs. Peter Korbos as godparents. On September 13th and 14th, Great Vespers & Divine Liturgy were held with His Grace Bishop Aimilianos, Father Selimos, other clergy and many of the faithful. In 1970, the church and school building were paid in full. The Parish Council considered the purchase of a large piece of property at 63rd and Sayre Avenues in Chicago. It was purchased and then sold at a later date. On Saturday November 13, 1976 at 3:00pm our church building caught fire. After another fire the next day, the church building was ruined and gutted. However, the school building next door was not damaged, so Father Selimos held daily Church services there. Sunday liturgy was held at Walsh School in Summit. Greek school classes also were held at Walsh School during the week. On August 11, 1977 at the General Assembly Meeting, a motion was passed to build a new church and Youth Center. Through the efforts of Mr. Evans Nickolaou and Mr. Christ Dineff, the property at 7560 S. Archer Road, in Justice was purchased. His Grace Bishop Ezekiel gave the blessing. Father Jon Magoulias came to Holy Cross on April 12, 1980. Under Father Jon’s guidance, our Holy Cross continued to grow. Shirley Contos completed much of the beautiful iconography. In May 1980, His Grace Bishop Iakovos and other Greek Orthodox faithful, went on a pilgrimage to the Holy Lands and upon return to Chicago, a piece of the Holy Cross of Our Lord and Savior Jesus Christ was given to our Church and placed on the Holy Altar. Father Demetrios Kavouras was assigned to Holy Cross in September 1986. Father Kavouras requested the completion of additional iconography in the church. He also ordered the dome and the cross for the top of the church. From October 1994 to March 1995, Father Jim Gordon served as interim priest until Father John Kalomas began his ministry at Holy Cross on March 1, 1995. We were also blessed to have Father Nicephoros Tzardimos helping us at that time. Father John Kalomas served our community for 9 years with much dedication and hard work. He is now assigned to St. Andrews Church in Chicago where he continues his work within our Metropolis. Father Michael Constantinides joined the Holy Cross family on June 1, 2004. Before coming to Holy Cross he served at Annunciation Church in Milwaukee, WI. for 4 1/2 years. He is now assigned at St. Nicholas where he continues to work within our Metropolis. Father Athanasios Pieri joined the Holy Cross family on September 10, 2010. Before coming to Holy Cross he served at Assumption, Chicago for 6 years. We all look forward to the future growth of Holy Cross for the Glory of God.